Mobility requirements in the conurbations and business centers and for leisure transportation are increasing steadily, and accessible, combined mobility is growing in importance every day – innovative solutions are required. PostBus intends to further strengthen its leading market position in public bus transport in Switzerland. As a mobility and technology service provider, we are continuing to develop our system services and increasing our range of products along the mobility chain. Internationally, PostBus wants to grow in clearly defined niche areas and build up additional sources of earnings. 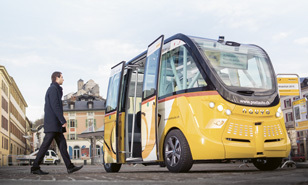 In a pilot project at the Sion mobility lab, PostBus is currently testing two autonomous electric shuttle buses. With no driver, they should soon be carrying up to eight people safely through the cantonal capital of Valais. The idea is simple and compelling: when a person shares a car instead of getting behind the wheel themselves, there's one less car on the roads. At PostBus, this solution to easing traffic congestion is called PubliRide. From mid-2016, 1,500 bicycles and e-bikes will be available from at least 100 locations in the city of Zurich. This is the largest and densest network of self-hire bicycles in Switzerland. PostBus subsidiary PubliBike AG is setting up the bike stations at its own expense and will operate them for an initial period of five years in collaboration with the social services department of the city of Zurich (SEB). Since 1 August 2015, customers renewing their half-fare travelcard or GA travelcard have received the new SwissPass card. 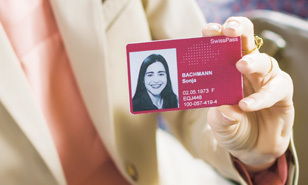 The SwissPass shows a photo and the name and date of birth of the owner, but no longer includes the type and validity of the subscription, which means that all transport companies have had to introduce a new inspection system. PostBus inspectors now use rugged industrial smartphones as readers. These are used to check the validity of the SwissPass using the RFID chip in the card. Send a free SMS to the number 454 – and a few moments later, your PostBus ticket is already on your smartphone. This is all thanks to the SMS ticket service from PostBus. Passengers send an SMS with a short predefined text depending on the number of zones for the planned trip. The ticket price is automatically charged to their mobile phone bill. PostBus is currently testing this new feature in the Sion local network, where it is performing very well: “The service is used very often, and we're confident that we'll soon be able to offer the system to other transport companies,” says Alain Gretz, Deputy Head of PostBus, Valais region. The advantages of SMS tickets are obvious: tickets are easier to purchase at the same price, and drivers don't lose time selling tickets. Ms B. from Lucerne travels a lot on business: her customers are in Lucerne itself, in Schwyz, and also in Berne and Fribourg. For longer journeys, she likes to use public transport so she can get some work done while travelling. Ms B. used to use the smartphone apps from the various fare networks for her regional train and bus connections. With the launch of its SensiBus toolbox, PostBus wants to raise awareness among children and young people of the correct use of Postbuses and public transport. Ariana boards the Postbus. She hasn't bought a ticket. Instead, she's confirmed that she has boarded on her smartphone. From then on, she doesn't have to worry about a thing, because her smartphone will remember when she gets off: namely when it loses its connection to the Postbus WiFi. This particularly passenger-friendly e-ticket is called “CiBo – Check in, Be out”. PostBus plans to test it in 2016 with voluntary participants in the city of Sion, and also find out whether it proves popular among passengers. The chances are good, because CiBo has a number of advantages: Ariana will receive an invoice for all her journeys at the end of the month. The system always selects the cheapest price for its calculations. If she travels often, instead of having to pay single fares, Ariana will only have to pay a maximum of the cost of a monthly pass.